Explore what the Cross means for you today with this book on the lasting power of the Easter story by Amy Boucher Pye. Want a life-giving Lent book? A Lent book to explore the freeing, life-changing nature of forgiveness. As we move from Ash Wednesday to Easter Day, we will engage with biblical and modern-day stories of wrongdoing and forgiveness as we experience the living power of the cross of Christ. Our journey through Lent will deepen our love for the Bible as we see it applied to our lives today. Amy Boucher Pye is a writer, speaker and editor, and the author of Finding Myself in Britain: Our Search for Faith, Home & True Identity (Authentic Media, 2015). She runs the Woman Alive book club and enjoys writing Bible reading notes for Day by Day with God and Our Daily Bread, among others. The Living Cross by Amy Boucher Pye was published by BRF (The Bible Reading Fellowship) in November 2016 and is our 1899th best seller. 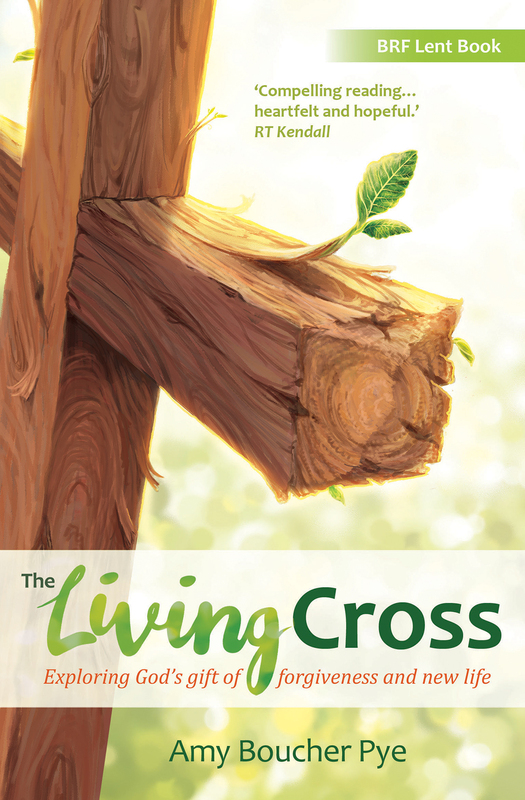 The ISBN for The Living Cross is 9780857465122. For the first time in living memory I actually managed to read a 'seasonal' book all the way through and in the right season! In this case the season was Lent, and the book was 'The Living Cross', by Amy Boucher Pye. Full disclosure: Amy is a friend of mine, and to be honest, I probably wouldn't have picked up the book if she wasn't. Forgiveness isn't a topic that I felt I needed to learn much about. I've received it (from God and others) and given it (to others and myself) and felt that was enough. However, the book had some really interesting insights and taught me some things I didn't know before. For example, have you ever noticed that in the Old Testament forgiveness is only something that comes from God? He never requires his followers to forgive one another (with the possible exception of Hosea, who was commanded to take back his adulterous wife, but still the word 'forgive' isn't used). The idea that we need to forgive others is entirely a New Testament concept. That's fascinating, and the kind of insight I really enjoy. The book is very well researched, and includes quotes and insights from a variety of authors, and the suggested exercises at the end of each week's readings included some very creative ways of engaging actively with the ideas rather than simply passively reading. They and the questions Amy provides for further reflection would make it easy to use this book in a small group study context, and I've bookmarked a couple to come back to. My one criticism would be that a large portion of each day's reading was taken up with retelling the Bible story/events that had already been covered in the passage. I suspect that's a fault of the format Amy was given rather than her own decision, but it did mean that I often felt as though Amy's space for teaching/reflection was cramped by the need to make sure all readers were up-to-speed with the biblical context. Over all, though, Amy managed to find an awful lot more to say about forgiveness than I could have imagined, and condensed it into daily readings that were long enough to feel substantial, but short enough to be able to read two in a day if you missed a day - which was key to me actually finishing on time! Thought-provoking and helpful (and not just for Lent - buy it now!). This is the best Lent book I have ever read. It offers daily reflections and prayers with forgiveness as it's central theme. Each day's reading weaves scripture together with real life stories and Amy's skilled writing and deep biblical knowledge helps guide us to a place where we can implement and receive forgiveness in our daily lives. There are also helpful spiritual exercises to work through for the reader be it individually or within a group. Although this is a book of short daily readings there is such depth and treasure within it and I for one will be rereading it again and again as the lessons within are constantly relevant to our ongoing journey with God. I can't recommend it highly enough! Take a peek at some articles related to The Living Cross. Got a question? No problem! Just click here to ask us about The Living Cross. This is quite the best of all the Lent books I've ever read. I just loved the way Amy takes us through the Bible, revealing God's forgiving heart and His burning desire that we should forgive one another. Few topics are more central to the Christian life - and life in general - than forgiveness. In this Lenten guide, Amy Boucher Pye traces the forgiveness theme through the length and breadth of scripture, finding it in both expected and surprising places. Combining deep insight and practical exercises, The Living Cross will help you live free from offences both committed and suffered. A Lenten journey you won't want to miss. From the Fall to the Cross and beyond, Amy Boucher Pye walks us down the centuries to meet the One she calls the "Father of outstretched arms." With captivating writing and inspiring biblical insight, we are reassured from the stories of fallen heroes, fallible leaders and plain ordinary sinners that God's lavish forgiveness is available to each one of us. The more I read the more excited I became, and the more thankful I am for God's "scandalous grace and love poured out." Simply superb. I can't wait to read it again!